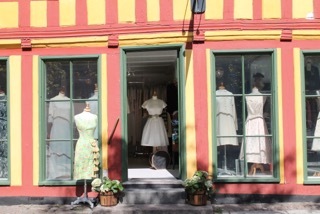 Vintage Divine shop in Aarhus, Denmark. Photo by Mette Marie Aaes Emery. 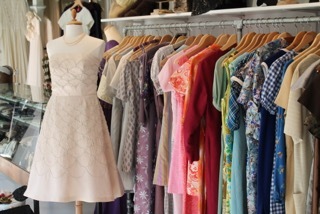 In Aarhus in Denmark you’ll find a very special vintage store owned and run by Mette Marie Aaes Emery. There you will find the best quality of vintage from 1920th-1970th. You can tell that this is Mette’s passion by looking at the pictures but as an Art Conservator as well this is something she has great knowledge of. I first discovered this treasure of vintage a couple of years ago when I noticed a Katja of Sweden dress for sale. A few days later and the dress was delivered nicely. After that I receive emails with lovely pictures of divine vintage for sale. Mette with passion for vintage from the 1920th, 1950th and early 1970th especially. Photo by Mette Marie Aaes Emery at Vintage Divine. Mette started to collect when she was 18 years old but needed to sell out her collection in 2009. Hence, she started a web-shop (as you do!) and of course it all went well. In 2012 she opened her first shop in Aarhus. Due to her knowledge she had the opportunity to be part of the TV-program Skattejaegerne, which obviously must have been good marketing. Today, she runs an even larger shop at Klostergade in Aarhus. Mette loves the beautyful artcraft with feminine details that rarely are produced nowadays. She gets inspired by her own collection of magazines for example Vogue and Le Chic Parisienne. All washing, ironing, photo shooting and running the shop Mette does herself but with some support from her mother who is an expert in wedding dresses. Katja of Sweden has inspired many generations with her design. Let me introduce you to one of those vintage experts who stands out. Ida Nielsen is a Textile Teacher with great interest in fashion history, especially from the 1960th and the 70th. Ida Nielsen says that Katja Geiger’s design was fashionable even though her design had her own style. 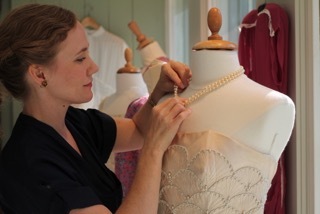 Through her interest and her education Ida Nielsen has an eye for quality. Her own wardrobe sparcles with colours with nearly 250 vintage dresses, 15 of those made of Katja of Sweden. She often wears Katja of Sweden dresses but she would never amend them. The respect for Katja Geiger’s creation is high. If you want to see more of Ida’s wardrobe please see her instagram Idasgarderob or her blogg hebreiska.blogg.se. You can read more about her on Facebook Sagamodellen or Instagram Sagamodellen.